It's been almost 2 months since the brewday for my rye spiced saison and about time I got tasting notes up. Overall I am reasonably happy with this but my memory of my first batch is that it is better than this one. The big thing I think I'll change for next time is lowering the amount of rye and lightening the malt overall. But all things considered this is a good base to work off of for next time. Spicy rye comes through strongly. There is a strong woody spice with some pepper, and the fruity yeast character is of golden raisins and grapes with some stone fruit (like plums and a bit of peach). The ester character/fruityness is good with more grape and less stone fruit in the aroma than in the taste. The aroma overall is more balanced toward spicy/phenol character. The rye probably helps that out a lot and the rye is very forward in the aroma. Although a lot of these descriptors (like the grape and plum) might sound dubbel-like, the beer has definite differences from what you might find in a dubbel. The fruityness is a bit lighter and the spicy characteristics are different. There is a mild bubblegum aroma, but I didn't notice it until I specifically looked for it. Pretty chestnut color, hazy. Has a thick tan head with good retention and nice lacing. Overall it is quite pretty. Again the rye is rather forward. There is a cool combination of spices and yeast-derived esters which I think it at least partially driven by the juniper. It is mildly resinous and has a surprising bitterness in the finish. The pepper is a bit forward and adds a bit of roughness to the bitterness in the finish. The fruity character is stone fruits and grape/raisin like the aroma, but with the balance more toward stone fruit. There is a rich malt character with a strong munich character and dark rye. Medium/light body (I think the rye adds a a bit of viscosity which increases the perception of body). There are hints of warming alcohol. The carbonation is high and pleasant. There is a light tartness in the finish, probably from the levels of acidulated malt. 1) I'll go for a lighter beer (in color, body and strength) using a base of pils plus a good amount of munich and a bit less rye. I'll keep the spices the same and drop the pepper a bit. 2) Keep the base and maybe make it a touch darker and brew it as a winter oriented rather than fall oriented saison. I'll probably go with more carafa or something like that. And I'll change up at least some of the spices. 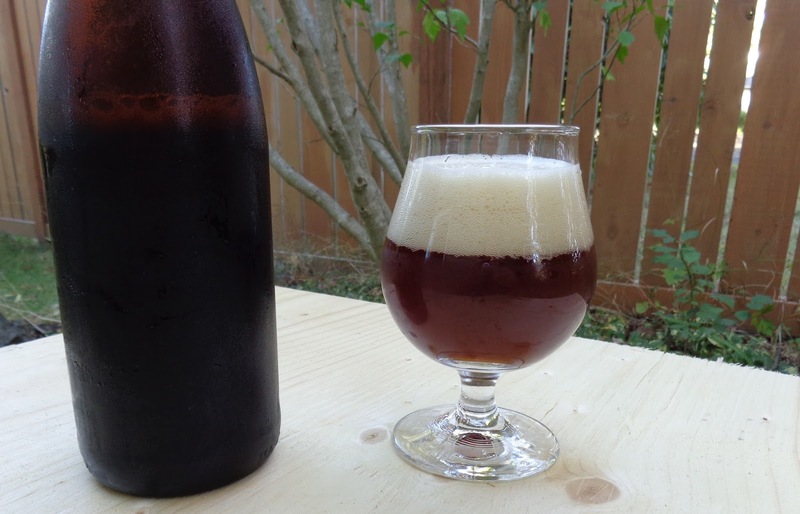 Is this the same Rye Spice Saison that you entered in the 2014 Half Pints Pro/Am Challenge? Yup, this is the same one.